April 2011 – OpenTech Alliance, Inc.
PHOENIX, Arizona – April 22st, 2011 – OpenTech Alliance announced that Storage 2000 is very pleased with the performance of their new INSOMNIAC AssistantManagers. Susan Head, Vice President of Operations for S&W Property Management, is responsible for the success of the company’s portfolio of self storage facilities. “I would always say – one day – I will have one of those kiosks,” said Head after visiting the OpenTech trade show booth countless times in years prior to purchasing 4 INSOMNIAC kiosks. The kiosks have been a turning point for the Storage 2000 facilities. “I like to keep my investors happy and that means making them as successful as possible. I send them rental reports every month that demonstrate the phenomenal business we are doing with the INSOMNIAC kiosks and call center,” she added. Her investors (including leaders of the industry’s top builder – Betco) are getting a great return on their investment in kiosks and it adds value and convenience to the customer experience. Head manages two facilities in Stafford, Virginia (one with 900 units), one in Fredericksburg, Virginia and a fourth in Columbia, South Carolina. Her manager at the 900 unit facility in Stafford, Doris Toombs, jumped on board with Head’s idea for the kiosk. “I knew it was going to be huge,” said Toombs. “With the kiosk, I can manage and market my property without fear of losing a customer.” Toombs does a great job of educating her customers on how to use the kiosk. “We are teaching them how to fish – and they are reeling it in,” she added. However, in some locations a few customers are still adverse to technology,” said Head. “They are a bit shy with it, even after we show them how easy it is to use. I think the last hold outs will come around, it’s just going to take a little more time. Kiosks are used in various industries such as banking, airports, etc. even before self storage. I believe it is the way of the future,” she added. Another hurdle for Storage 2000 is the amount of competition. 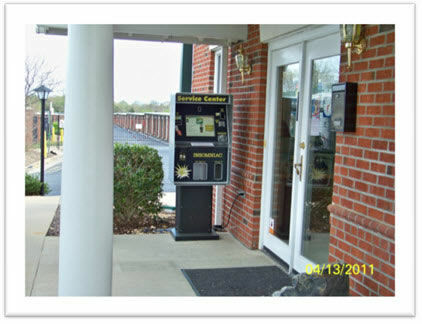 With more than a dozen competitors in a six mile radius (three are industry leaders), the customer convenience of the kiosk is giving Storage 2000 a competitive advantage over the big guys in her area. Head operates her facilities with one manager (40 hours a week) and one assistant manager (24 hours a week). “Add an INSOMNIAC AssistantManager to that team – and we are winning more business than our competitors because we are open when they are closed,” she added. OpenTech’s innovative solutions increase revenues, reduce operating costs and improve customer convenience for self-storage businesses. Their solutions include 7 models of INSOMNIAC self storage kiosks ranging from $5,500 to $18,000, INSOMNIAC Live! call center services and the INSOMNIAC Self Storage Network for online storage reservations and rentals. For more information on OpenTech, please visit www.opentechalliance.com or call (602) 749-9370.